From 1983 to 1995 Owen Bieber was president of the United Automobile, Aerospace and Agricultural Implement Workers of America, the third-largest labor union in the United States. He was a key figure in the U.S. auto industry during a period of dramatic change. Owen Bieber, the son of Albert F. and Minnie (Schwartz) Bieber, was born in North Dorr, Michigan, on December 28, 1929. After graduating from Catholic grade school and high school in 1948, he went to work at McInerney Spring and Wire Company in nearby Grand Rapids, Michigan, the same auto supply plant where his father worked. Bieber was already a large man, and his first job was bending by hand the thick border wire on car seats. A year later, at age nineteen, Bieber was elected as an officer of his plant's union, United Automobile Workers (UAW) Local 687. Bieber began to work his way up the union ranks in Grand Rapids. By 1955 he was elected to the local bargaining committee and was involved in talks on local plant issues. In 1956 he was elected president of the local chapter. Bieber, a devoted Democrat, also worked on behalf of Senator John Kennedy's (1917–1963) campaign for the U.S. presidency in 1960. Bieber's hard work brought him to the attention of leaders at the UAW's regional office in Grand Rapids, and he continued to move up. In 1972 he was appointed director of the region, a position he held until 1980, when he was elected a vice president of the UAW and moved to the union's Detroit headquarters. Bieber served as director of the UAW's General Motors (GM) department, the union's largest department with more than four hundred thousand members. It was Bieber's first public exposure beyond Michigan, as GM's plants stretched across the country. By early 1982, because of low car sales and foreign competition, Bieber found himself agreeing to the first contract in the history of GM in which workers made concessions (gave back things already won). GM workers agreed, among other things, to put off annual wage increases and accept less paid time off the job. The workers approved the contract by only a slim margin. 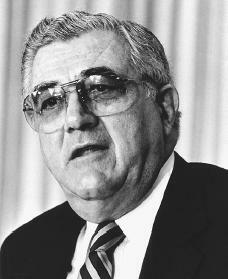 In 1983 the UAW was forced to find a replacement for then-president Douglas Fraser, who was retiring. Bieber, who was known for being tight-lipped, was the last of three men to declare his interest in the job in late 1982. Nonetheless, he was selected by the union's executive board in a fifteen to eleven vote. The nomination, supported by a vote of delegates to the UAW's constitutional convention, surprised some who noted Bieber's shyness and lack of experience with the national labor scene. Bieber's first three-year term was highlighted by the job security measures he won in the contracts with the Big Three automakers—General Motors Corporation, Ford Motor Company, and Chrysler Corporation. In 1985 Bieber also won a more than $2,100 payback for each Chrysler worker for concessions given to the automaker when it was struggling to stay in business from 1979 to 1983. This made Bieber very popular among UAW officials and workers. and a slowdown in auto sales in the early 1980s. Bieber struggled to find a balance between the companies' demands to be competitive and the needs of his members to keep their jobs. The UAW demanded a national industrial policy to help protect jobs. It also proposed a requirement that foreign carmakers build a certain percentage of car parts in the United States to help create jobs for American workers. In 1984 Bieber was named to Chrysler Corporation's board of directors. Industry observers remarked that the seat really belonged to the Chrysler workers who had granted major concessions during the company's earlier financial problems and were the single largest group of shareholders in the corporation. In 1985 Bieber was in the awkward position of calling a strike against Chrysler when contract talks broke down. The strike was settled a week later following a forty-two-hour bargaining session, but neither side was happy with the new contract. The company blamed the expensive strike on Bieber's angry and ineffective bargaining style. Bieber told Ward's Auto World that future contract talks with the Big Three automakers would focus more on issues such as job security, reduced work time, and national health care rather than simply money. Bieber helped create some original labor agreements. For example, he got the automakers to create job guarantee programs that ban them from laying off workers when machines take over their jobs. Instead, the companies must find new work for the employees and retrain them if necessary. In return, the union agreed to smaller than usual increases in pay. Bieber also worked on the first labor contracts for GM's Saturn small-car project, which began producing a new generation of American cars in 1990. The contract lets auto workers share in some management decisions regarding how the plant is operated. In return, the UAW agreed that Saturn workers would receive starting pay that is slightly less than the going rate at traditional auto plants. By 1992 Bieber and the UAW were stuck in a bitter losing battle with Caterpillar Inc., a manufacturer of earth moving equipment. When contract talks failed, Caterpillar began hiring replacement workers. The strike lasted five months before the UAW gave in and ordered its members back to work without a contract. In a desperate attempt to show the strength of the UAW as 1993 Big Three contract talks approached, Bieber made an angry speech at a 1992 UAW convention. He warned auto companies against pushing the union too hard, saying that " … it takes two to make peace but only one to make a war." Despite Bieber's speech, the UAW was still facing a bleak future, and Bieber's leadership of the union was doing little to improve the situation. In 1992 GM announced plans to close twenty-one plants and cut an estimated fifty thousand UAW members from its workforce. Union membership also declined. In 1978 the UAW had represented 86 percent of the auto industry's workforce. That figure fell to 68 percent by 1992, and since 1979 total UAW membership had fallen from 1.5 million to 1.1 million. Pressure began to build on Bieber to turn things around or to resign. In 1995 Stephen Yokich, head of the UAW's GM department and longtime rival of Bieber's, took over the job after Bieber reached the retirement age of sixty-five. In his farewell Speech, Bieber spoke out against Japan's unfair trade practices and warned unions that they would have to watch out for Republican attempts to hurt working families. Automotive News (November 22, 1982). Flint Journal (November 18, 1982). Industry Week (July 5, 1993).